The thermal conductivity calculator is a tool that lets you calculate the thermal conductivity of any material or the heat flux through any object according to Fourier's law. This article will provide you with a definition of thermal conductivity, explain how to use the formula for heat flux correctly and analyze the thermal conductivity units in greater detail. Thermal conductivity is a measure of a material's ability to transfer heat. It does not depend on the external conditions or the object's mass - it's a property inherent to a given material. It is proportional to the heat energy transferred and to the distance of heat transfer, and inversely proportional to temperature difference across the material. For example, imagine an insulated wall. Its thermal conductivity is low if only a small amount of heat energy is transferred through it. q is the heat flux, measured in W/m^2. The negative sign describes the direction of heat transfer. As heat always flows from a warm body to a cold body, the direction of heat transfer is alway opposite to the temperature gradient. Enter the value of temperature difference across the object. We can assume a difference of 20 K.
Determine the thickness of the object - for example, 35 cm. Enter the thermal conductivity of the material if you want to find the heat flux through it. Let's assume a brick wall of conductivity equal to 0.8 W / (m * K). Calculate the heat flux according to Fourier's law: q = - λ * ΔT / Δx = - 0.8 * 20 / 0.35 = -45.71 W / m^2. This results means that every second, 45.71 joules of heat energy are transferred through every 1 m^2 of the wall. 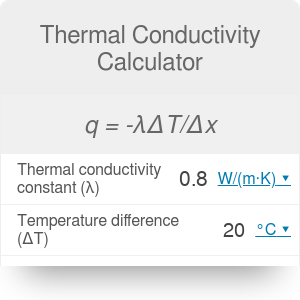 You can also use the thermal conductivity calculator to find the λ coefficient. Make sure to check out the thermal expansion calculator as well. Thermal Conductivity Calculator can be embedded on your website to enrich the content you wrote and make it easier for your visitors to understand your message.